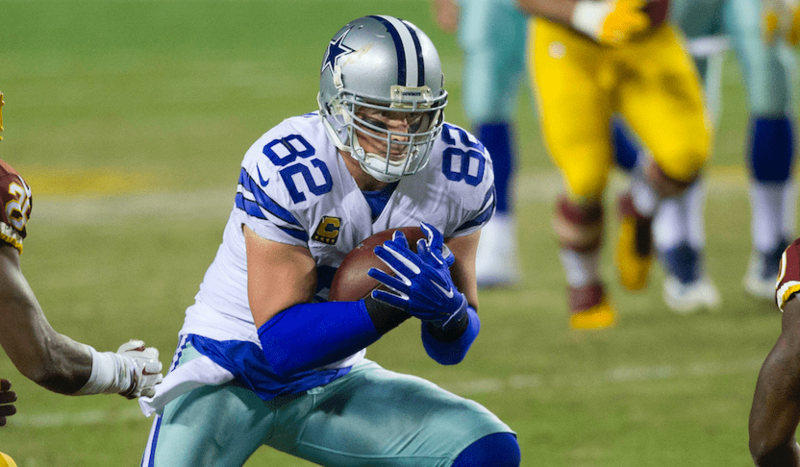 Jason Witten says God didn't give him his talent "just to win titles"
In his nine-year NFL career, Dallas Cowboys tight end Jason Witten has become a model of stability, security and super-sized plays. But to achieve his many NFL honors and to earn the respect of teammates and fans, Witten had to overcome unbelievable odds as a neglected child to become a true champion on and off the field. He became a star youth athlete in rural Tennessee, meeting his future wife at age 15 in tiny Elizabethton, before becoming a star at the University of Tennessee and being drafted in the third round by the Cowboys. Before that, though, he had to overcome the difficulties of an absentee father in Washington, D.C., where everything good that had happened in his life was first balanced by the negatives faced by millions every day. His father, Ed, was an infrequent presence in his life, and then only for negative memories. 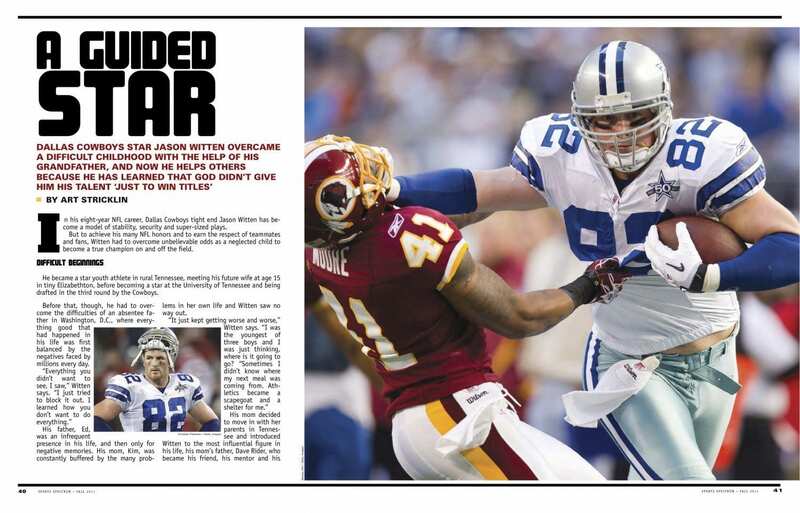 His mom, Kim, was constantly buffered by the many problems in her own life and Witten saw no way out. His mom decided to move in with her parents in Tennessee and introduced Witten to the most influential figure in his life, his mom’s father, Dave Rider, who became his friend, his mentor and his high school coach. Now, an established NFL star, and perennial Pro Bowl performer with the Dallas Cowboys, Witten stands before men’s groups and impressionable boys to talk about the importance of family and fathers, grandfathers and role models. Jason and his wife, Michelle, have two young boys, C.J. and Cooper. The star tight end admitted it can be a struggle to be an all-pro dad and all-pro player. While Witten often tried to forget his rough childhood, prior to age 13, he now remembers it for the benefit of helping others. “When I got to Tennessee, God provided 20 times the blessing than I had problems in my life,” he says. Moving to the two-spotlight town of Elizabethton from the fast and harsh world of Washington, D.C., Witten learned that families would often eat together, pray together and attend church together. 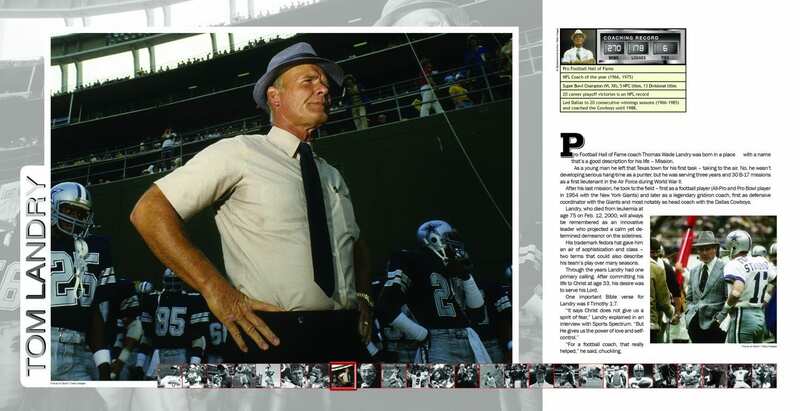 Rider provided the structure Witten had been lacking in his life, both as a coach and more importantly, as a spiritual mentor. He also guided Jason’s two older brothers, Ryan and Shawn. Interestingly, Shawn was recently named head coach at Elizabethton High School, which plays at Dave Rider Field. While Witten admits he has benefits and obstacles in his life as an NFL football star, obstacles most people will never encounter, he says every dedicated man can guide their own life and others in the right direction. He saw that lesson in a big way last year during an off-season sponsor signing in New York City. Although he joked he was a man without a job during the recent NFL lockout, Witten said every man has to take his responsibilities to be a Christian leader at home seriously at all times. With the sponsor activity, the schedule called for Witten to fly up to New York early Saturday morning for the signing. Then, the sponsor offered to put Witten up in a nice New York hotel Saturday night, arrange a big dinner and get him home sometime Sunday. He enlarged that mission four years ago by forming the Jason Witten Score Foundation with his wife Michelle to channel his charitable contributions to a group of people who need help most. Included in the Foundation is the new Scorekeepers project which puts positive role models in kids’ lives like Witten longed for before Rider came into his. Michelle, a nurse at Parkland Hospital’s trauma center in Dallas who has known Witten for more than a decade, says she keeps her husband accountable to help others. “It’s not about putting your name on a building, but about helping others in need in your community in any way you can,” Michelle says. Because Witten, like most star athletes, lives his life in the public arena he is not afraid to admit where he has stumbled publicly. As he begins another NFL season, Witten says he wasn’t making predictions about the Cowboys on-field success or failure on the NFL scoreboard, but felt impressed to tell others what God has in store for him this fall. Along with his foundation, one of his largest projects is the huge, free football camp he stages every summer in Elizabethton. Last year it attracted 1,500 kids to Rider Stadium to be instructed by Witten, local coaches and friends, along with Dallas teammate Bobby Carpenter. 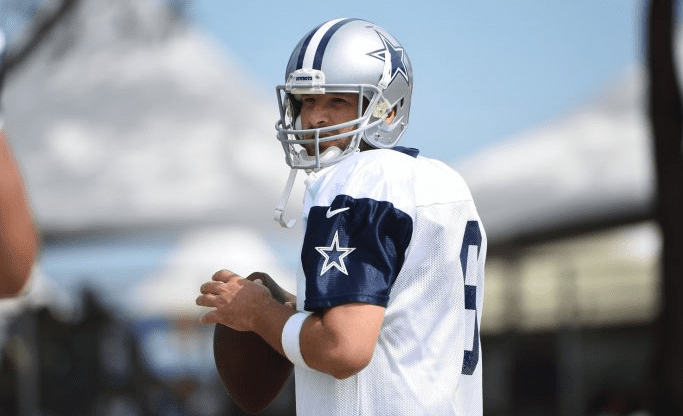 Quarterback Tony Romo has also been a part of the camp in the past. His commitment to family, purity and legacy also provided him the chance to reestablish his relationship with his father, Ed, after the years of struggle. Regardless of the on-field honors, the Pro Bowl appearances, playoffs or even the title of Best Active Tight End in the NFL today, Witten says he aspires to a higher calling. Which is likely the greatest catch of his storied football career. 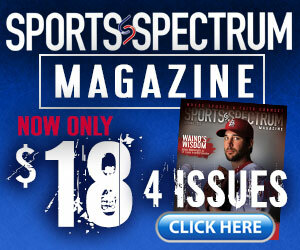 This story was published in the Fall 2011 issue of Sports Spectrum magazine.